The debut of the first 30 production Tesla Model 3’s at the company’s Fremont assembly plant seemed anticlimactic. It has been almost a year and a half since the original prototype was unveiled and, since then, spy photographs of the car have been steadily making their way online. While the overall shape and design of the car isn’t much of a surprise, there are a few new details about the Model 3 that could make it a transformational product for the industry. First is the price and what it will actually compete against. The assumption is that the Model 3 will have to win customers already looking for an electric vehicle like the Chevy Bolt or Nissan Leaf. While comparably priced, these two models sell themselves on practical appeal. With the Model 3’s base price of $35,000 and topping out at nearly $60,000 for a fully optioned version, people are more likely to be looking at German sedans from Audi, BMW and Mercedes in those price ranges. Add to that the performance and technology characteristics that, for now, link it closer to traditional petrol sedans. Tesla’s original pricing vision with the Model 3 was to start high and refine the price as battery supply and technology improved. A remarkable option on the Model 3 (which comes at a cost) is the Long Range Battery. It boosts the standard battery range from an estimated 220 miles up to 310, which is pretty astounding. That’s nearly New York City to Pittsburgh or Los Angeles to Cupertino on a single charge. The next closest on range is the larger Model S and X, and then there is a wide gap to everything else. The battery upgrade costs $9,000. We get to see the Model 3’s production interior for the first time. 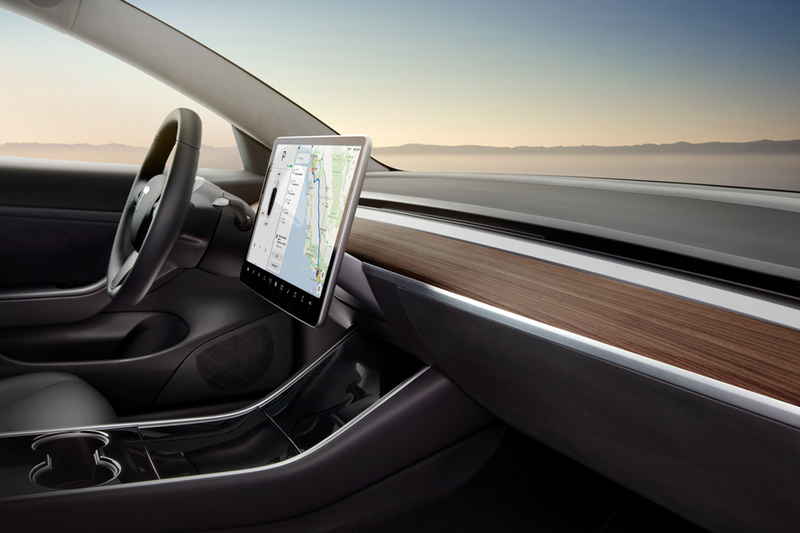 The clean, thin dashboard is accented with real wood and sports a large touchscreen in landscape format. Nearly all of the tradition switchgear has been removed and controls are accessed through the display. The panoramic style windshield from the Model X has been implemented on the Model 3 for both the front windshield and back glass. 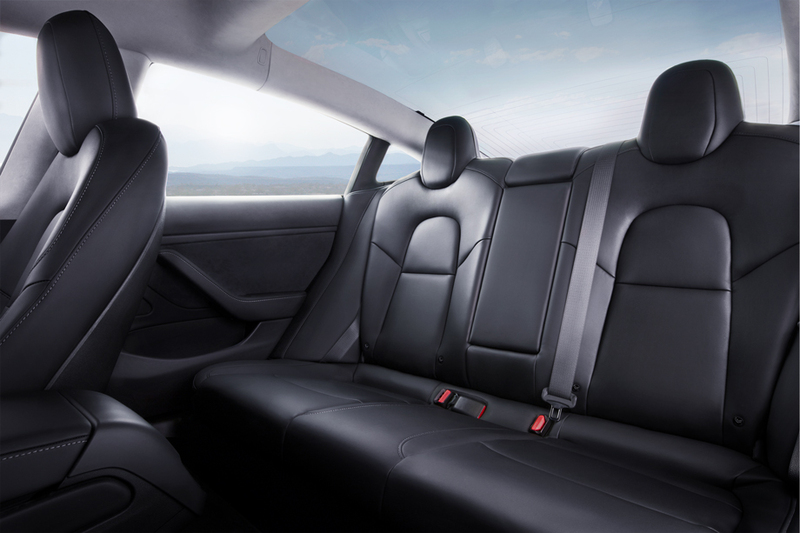 The larger glass area aims to give backseat passengers a less claustrophobic feeling. The Fremont launch event was half party and half pep talk. Elon Musk, who spoke to a large crowd of Tesla employees, described the next six to nine months as “production hell.” The Model 3 is going to push Tesla’s manufacturing capabilities to new levels. It already has half a million Model 3 reservations from customers, who each paid a deposit of $1,000. The complexity of hitting production targets is pretty vast. Tesla relies on a global array of suppliers, any of which could fall behind and wrench the schedule. For 2016, the company built nearly 84,000 Model S and X vehicles. Its goal is to reach 500,000 vehicles per year—more than five times their best year so far. It is worth watching the short launch presentation video below to hear Musk describe the reality all Tesla workers probably knew was coming and what they’re going to have to do in order to succeed.